Learn how to draw a Force Field Analysis Diagram to make a change in your life, master this management technique within 4 steps. Are you struggling with some changes in your life? Do you have hesitations about whether to make a change or not? A Force Field Analysis might be able to help you get moving! Force Field Analysis is one of the great tools to manage change to achieve a certain goal at work or in daily life. Click here to see the definition of Force Field Analysis to get a full understanding about how FFA can help manage changes in life. What is the part that needs to be changed about the current situation? What kind of result do we need to reach after the change? What are the forces that would support the change of situation and to get to the desired aim? How can those forces help? Place those driving forces on the one side of the Force Field Analysis diagram, with arrows pointing to the center. Are there any inter-relationships among those driving forces? Have a good analysis. What are the forces that prevent the proposed change from developing and maintain the current status? Place those forces on the other side of the Force Field Analysis diagram. Are there any inter-relationships among those forces? 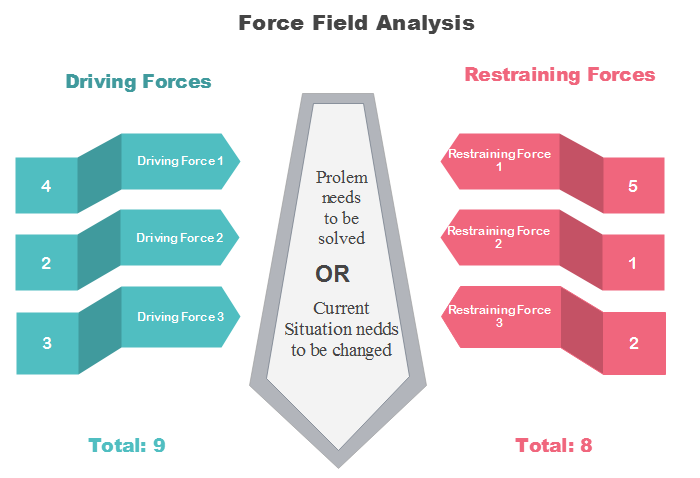 After listing the driving forces and restraining forces on the Force Field Analysis diagram, compare them and decide if it is realistic to put the proposed change into action. Edraw is a professional and easy-to-use diagram software that can help you create a Force Field Analysis diagram without drawing skills required. It contains a large set of ready-made symbols that suit every theme. 1. Follow the instruction and open a new diagram drawing page: Available Templates - Basic Diagram - Arrows. 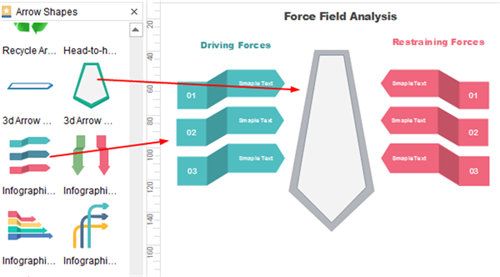 Double click to get started with the designing of your new Force Field Analysis Diagram. 2. 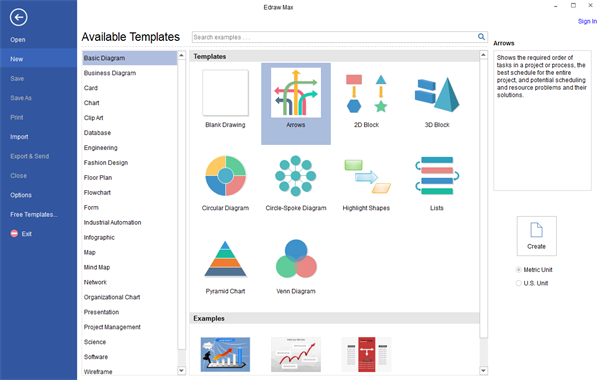 Add Arrows: drag and drop arrows that suit the subject to the drawing page. Sizes and colors of the arrows can be modified accordingly. Tip: Use "Rotate & Flip" button to change the direction of arrows. 3. Complete the Diagram: type in text for each arrow. The arrow at the center represents the "Problem or Issue" that needs to be evaluated, arrows on the left represents "Driving Forces" and arrows on the right represent "Restraining Forces". 4. Save and Export: once completed the design of your Force Field Analysis Diagram, save the file or export it as other formats if necessary.